The long history of British rule in India is one of the best-known examples of struggle against global imperialism. The Indian fight in the early 20th century against the power of Great Britain led to independence in 1947 and the subsequent split of the country into Hindu-controlled India and Muslim-controlled Pakistan. For many historians, this development also marks the end of the British Empire, which had been weakening as a global power since World War I.
British forces arrived in India in the 17th century and began exerting influence on its various rulers and states. Initially through the power of the joint-stock East India Company and later, after 1858, through direct control of the British Crown. The British Raj, as this period of direct rule was called, began at the near-peak of Britain’s imperial period and ended at its near-collapse. Silver collectors with an interest in European colonial history should certainly be interested in British Indian silver coins. Unlike most of its other colonial governments, the British administration in India did not impose the pound sterling system. Instead it took the old South Asian rupee coinage system and adapted it for use throughout British controlled India. Britain minted Indian silver coins in denominations from two annas (or one-eighth of a rupee) up to one rupee. Until 1939, all of these coins were minted in .917 (or 91.7%) fine silver, except for the two anna coin, which was debased to a copper-nickel alloy in 1918. 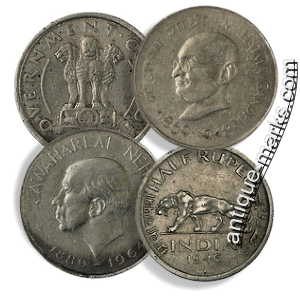 The one-fourth, one-half, and one rupee coins continued to be minted in a .500 silver alloy until 1945. From 1946 to 1947, the last two years of British rule in India, all rupee coins were made from base metals. After independence, India kept the rupee as its national currency. However, aside from several commemorative issues, India has never since then produced any regular Indian silver coins. British Indian silver coins may be slightly difficult for the westerner to hunt down. But for the dedicated coin or silver collector good specimens do exist and can be had for relatively cheap prices. You just have to spend a little more time than you would on other collectible British Commonwealth silver coins. 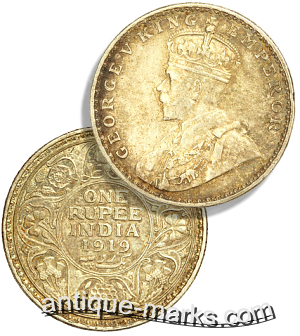 One additional bonus in collecting British Indian silver coins … is their relative simplicity in type and in silver purity: you don’t have to worry about any strange or confusing shifts in coin composition.